Migration Deal in Europe Makes No Commitments. Victory Is Declared. BRUSSELS — The European Union’s new agreement on migration does not obligate any country to do anything, but it appeared to be enough to save Chancellor Angela Merkel of Germany and provide a political victory to the new populist government of Italy. Leaders of the European Union argued, cajoled and debated for nearly 10 hours until dawn on Friday to come up with a set of proposals on how to handle migration, including the idea of establishing secured centers both inside Europe and in North Africa to screen migrants, identify and distribute legitimate refugees, and keep migrants from moving from one country to another. The leaders were not driven so much by humanitarian concerns — the levels of migration have fallen considerably — as by political necessity. In an important gesture of solidarity, Ms. Merkel’s colleagues gave her the “European answer” to her urgent domestic need — to face down a challenge to her leadership from her fellow conservatives in Bavaria and her own interior minister, Horst Seehofer. While Mr. Seehofer said little on Friday, senior members of his Christian Social Union suggested that Ms. Merkel had obtained enough to defuse the crisis, at least for now, and preserve her ruling coalition. Hans Michelbach, a senior Bavarian legislator, said that “something moved in the right direction in Europe,” adding that his party wanted to continue to work with Ms. Merkel’s Christian Democratic Union. Mr. Seehofer had warned that he would defy Ms. Merkel and establish a hard border with Austria unless she struck a deal to stem the flow of migrants into Germany who had registered in other countries. While Ms. Merkel remains weakened by the dispute, analysts suggested that she was safe for now, and that the clash had damaged Mr. Seehofer in the polls. After the E.U. 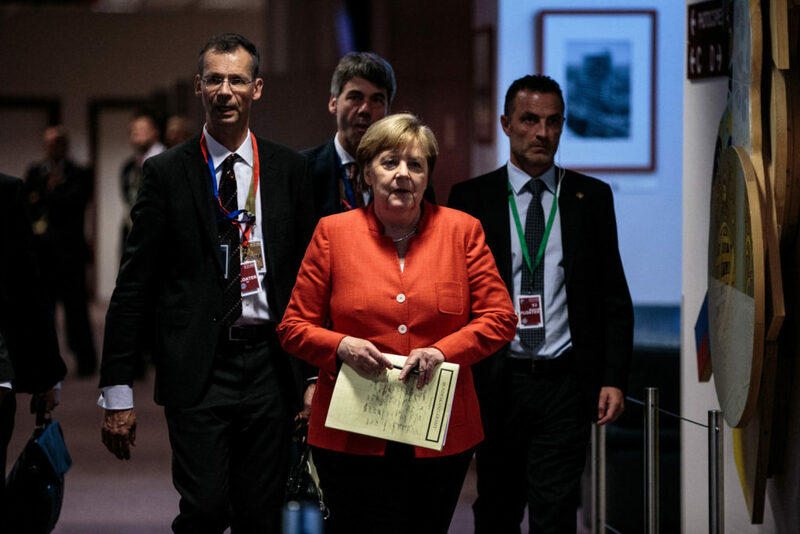 summit meeting ended on Friday, Ms. Merkel was able to announce that she had separately secured promises from Greece and Spain to take back migrants in Germany who had first been registered in those countries. Mr. Seehofer and his party can argue that they forced Ms. Merkel, and thus Europe as a whole, to grapple with the problem of secondary migration and emphasize that migrants cannot take advantage of border-free travel and choose where they want to live. Ms. Merkel, who has taken a welcoming stance on migration, was aided strangely enough by the new anti-immigrant government of Italy, which had made the issue a priority for this summit meeting. In a rare, aggressive tactic in the European Council, which operates by consensus, the new Italian prime minister, Giuseppe Conte, said that he would block agreements on all other issues unless Italy was satisfied on migration. As the long negotiations wore on, Mr. Conte was constantly on the telephone to check language with his deputy prime minister and interior minister, Matteo Salvini, the leader of the far-right, anti-immigration League, who has loudly insisted that Italy had taken in enough migrants and would take no more. As annoying as other leaders found Mr. Conte’s behavior — President Emmanuel Macron of France scolded him at least once — he succeeded in Italian terms. Mr. Salvini praised the conclusions on Friday. “I’m satisfied and proud of our government’s results in Brussels,” he said in a statement. “Finally Europe has been forced to discuss an Italian proposal,” he said, citing the outcome as an end to Italian passivity. But even he noted that nothing certain had come out of the meeting. “Let’s see the concrete commitments,” Mr. Salvini said. In fact, the document places no commitments on member states, which was important to governments in Central Europe, which have rejected mandatory quotas for migrants. Instead, the agreement emphasizes voluntary steps. Still, no country has leapt to volunteer to set up a screening camp inside its own territory, just as no country in North Africa has volunteered to host one outside Europe. But if carried out, the centers inside Europe will take some of the burden off the countries where migrants crossing the Mediterranean first land — normally Greece, Italy and Spain — while centers outside Europe could reduce the numbers of migrants taking the dangerous sea voyage, often with smugglers, to Europe. Under current practice, the country where migrants first arrive is responsible for registering them and determining whether they are refugees or not. These so called front-line countries have complained they have borne a disproportionate weight. Even as the leaders were talking here on Friday, Libya’s Coast Guard said that about 100 migrants were missing at sea, many feared dead after their boat capsized off the Libyan coast. The agreement also aims to limit the role of nongovernmental agencies that have been transporting migrants from off the Libyan coast, often saving their lives, to Europe, an important “pull factor” in the migration wave. It would require that the agencies not interfere with the Libyan Coast Guard in its efforts to control human smuggling. Doctors Without Borders, a medical charity that conducts rescue missions in the Mediterranean Sea, reacted bitterly. “The politics of the European governments condemns migrants to the horror of detention in Libya or to drowning,” the group said in a statement on Friday. But officials of the United Nations refugee agency were more cautious, promising help in setting up screening centers that would preserve the rights of migrants and asylum seekers. Charlie Yaxley, a spokesman for the agency, said it was awaiting a legal analysis of the E.U. agreement, but would welcome greater collaboration on asylum. He noted that recently, for the fifth year in a row, the “grim milestone” of 1,000 migrant deaths in the Mediterranean was crossed. Leonard Doyle, a spokesman for the International Organization for Migration, said it was “very pleased at the solidarity and consensus” that emerged from the summit meeting, in particular with the front-line states like Italy. Charles Michel, the Belgian prime minister, praised the agreement. Reporting was contributed by Katrin Bennhold and Melissa Eddy from Berlin, Jason Horowitz from Rome, Marc Santora from Warsaw and Milan Schreuer from Brussels.